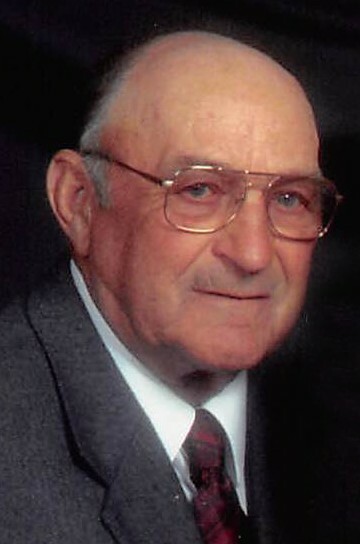 Obituary for Hubert (Hube) C. Houston | Hunter Funeral Home, Inc.
Hubert (Hube) Cletus Houston, 86, of Golden passed away at 11:28 A.M on Sunday, March 17, 2019 in Blessing Hospital in Quincy. Hubert was born on November 19, 1932 in Quincy. He was the son of Cletus and Hazel (Bullard) Houston. He married his high school sweetheart, Janice Aden on November 30, 1952, in Trinity Lutheran Church in Golden. Janice passed away on November 13, 2008. Hubert Proudly served in Company D 279th Infantry Regiment 45th division of the Army in during the Korean Conflict from February 1953 until December 1954. He was a partner, with Janice on the family farm. Besides farming, he raised hogs and cattle. He was very social and enjoyed many activities. He loved to have his morning coffee with his coffee club, golf, play cards, go to the gambling boat and Las Vegas, hunt mushrooms, pitch horse shoes and fish. He was a member of the Golden American Legion Post 801, pool leagues, bowling leagues and golf leagues. Surviving are; two daughters, Cindy (Tim) Keyes of La Prairie, Kimber (Bryan) Deming of Hillsboro; two sons, Rod (Cathy) Houston of Golden, Todd (LaDonna) Houston of Golden; grandchildren, Doug (Katie) Foote, Nick (Andrea) Keyes, Mark (Dusti) Houston, Ashley (Kacey) Burton, Ryan ( Kayla ) Houston, Joey (Melissa) Houston, Rebecca (CO) Varnes, Michael John Houston, Cole Deming, Dalton Deming; great-grandchildren, Jonathan Foote, Zach Foote, Ellie Foote, Dailey Houston, Britt Houston, Josie Houston, Zada Burton, Knox Burton, Harper Burton, Charlie Varnes, Kathryn Varnes, Taylor Varnes, Amelia Houston, Eloise Houston, Max Keyes, Delaney Keyes, Graham Keyes. Also surviving are; his best friend and brother, Marvin Houston of Holliday, Mo., and two sisters, Arlene Reynolds of Colorado Springs, Co., Carolyn Reisch of Texas and several nieces and nephews. He was preceded in death by his wife, Janice, infant daughter, Rebecca Kay Houston and his brother, Melvin. Services will be 10:00 A.M. on Saturday, March 23, 2019 in Trinity Lutheran Church in Golden with Reverend Gayle Pope officiating. Interment will be in Golden Memorial Gardens in Golden. Visitation will be from 4:00 P.M. until 7:00 P.M. on Friday, March 22, 2019 in the Hunter Funeral Home in Golden. Memorial contributions have been suggested to the Tri-County Golf Course or Trinity Lutheran Church.